So. Apparently, when I saw Joe C's story about "trading Francisco Liriano," I should have thought to myself "Maybe tomorrow isn't the best time to talk about veteran middle infielders." 2) similarly, the Twins don't consider him untouchable, so we all have his permission to talk about trading him. But we missed the bombshell here. It isn't that Liriano is on his way out the door. There is nothing in the story that implies anything is at all close, or that the Twins have even attempted to have trade talks with teams. 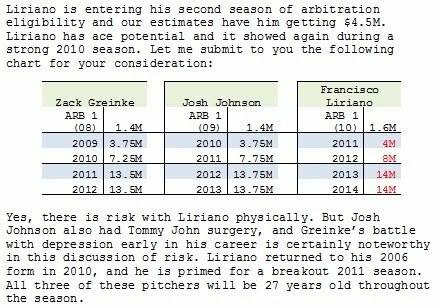 The bombshell is that the Twins, right now, don't value Liriano nearly as high we thought they did (and probably should). One area that is being misreported is that the Twins turned down a 3-year/$39 million offer from Liriano's agent. That isn't what Christensen reported. What he said was: "From what I've heard, their long-term talks went nowhere, with Liriano's camp hinting it wanted a three-year, $39 million contract." If you add up the 8/14/14 for 2012-14 for Liriano, you get $36M, or about $1M less per year than Liriano's camp hinted at. If that figure was a non-starter for the Twins, then they just don't have any interest in signing Liriano long-term, because it's awfully close to his market value. Now, maybe that changes. Maybe they just want to see more than one full-year out of Frankie, and I wouldn't blame them too much for that. But Christensen's primary point is very clear - right now Liriano is not considered an integral part of the Twins long-term future. Joe C said Liriano's camp wanted a 3/$39M contract, not an extension. There's a big difference there. He signed for $4M and the estimate for next year is $8M, which means Liriano will give up his first year of free agency for $27M? That's absurd. If I'm the Twins, I would be pissed. Hey meat the 3 yr, $39 million would not have started this season. It was to begin next year just like John said in his article. Get a clue!!! No, Joe C's direct comment was a contract, not an extension, meaning the contract would start this year. Twinsgeek used the term extension but that isn't accurate. It seems to me that the only message being sent is that the Twins aren't as convinced of Frankie's long-term value as Frankie and his agent are. A big first-half of the season may change things considerably. Sure seems risky to extend him to a big contract now with his 2009 production still in recent history. Last spring training, Lariano wasn't even guaranteed a spot on the starting rotation. And one year later you want to sign him to a 3 yr/$36 million contract? No! Look what happened when we rushed to sign Mauer to his obscene contract...a year before he was a free agent. You don't think the Twins FO wished they would have waited another year? You might want to email Nick Nelson. He claims to have spoken to a few people about it and that the 3/39 was to start in 2012... which is pretty reasonable if you ask me... essentially it's 4/43 which is not far off from where you guys guessed. Joe C's blog post today says the 3/$39M he cited he "presumes is an extension," which would make a lot more sense. I'm fine with waiting on a long-term deal. I think the Twins have been a little too aggressive in buying out arbitration years in which they already have control of the player, just not the exact dollars. Look what happened with Blackburn after he signed his deal. If the Twins had waited another year to re-sign Mauer, they wouldn't have been able to re-sign him. I think John with other posts has pointed out the potential problem. The Twins might be close to their cap of a maximum spending once they got into Target field. With that they're going to have to manage their money carefully. We're sort in a situation like the Vikings were in 2010 do we gamble on Brett Farve to stay healthy? We gambled and lost. Currently we got one major questionable arm which is Nathan. Do we want two long term options. As for the talk I think Joe C needs to get this clarified. I read they were asking for a 3 year contract in 2011 for $39 million. Other people are reading a three year contract in 2012 at $39 plus the 2011 year of $4.3 million. Those are two vastly different contracts. One thing not said is guarenteed money. Right now the Twins are on the hook for just $4.3 million. Do they want to on the hook for $43 million for a pitcher which is more likely to reinjure himself than Nathan? Liriano has the stuff, but not the mechanics. Remember a few years ago he had Tommy John surgery at a young age. It is not that the Twins don't value him, they know that they will not get the full length of whatever contract he signs before his arm fails again.